What is happening today? There is war, or at least revolution, across North Africa and the Middle East, and we are definitely tangled up in it in Libya. And, whether it is isolation politics or party politics, as I write the US House is debating cutting off the funding for that conflict despite that Libya’s leader is a terrorist who has a lengthy history of attacking Americans, including Pan Am 103 and a Berlin night-club frequented by GIs. Much of the US is leery of immigrants. So, what was happening then, in 1941, six months before Pearl Harbor? For beginners, on this very day in 1941, Axis attacks destroyed three Allied ships coming to the defense of troops near the coast at Tobruk, east of Benghazi, Libya. The Blitz in London had killed thousands of people and destroyed whole swaths of the City, but England was actually celebrating its fortune for Hitler having decided on June 22 to invade the Soviet Union. 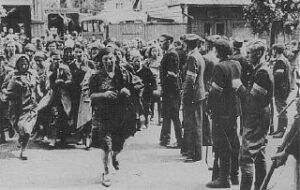 Not everyone celebrated — two days later the entire male population of the Jewish community Gorzhdi, in Lithuania, was exterminated. Dutch youths were rounded up in Amsterdam and transported to Germany, where they would die, for a revolt that happened in early June. Italy and the United States mutually closed their consulates in each other’s country in retaliation for asset freezes. The US House approved by a single vote the extension of the military draft. There were only 132,000,000 of us then, of whom 11,600,000 worked on farms. Chrysler began to manufacture B-26 airplanes and M-3 tanks in a factory it quietly had built behind the automobile production lines. The Maltese Falcon made Humphrey Bogart a star a year before Casablanca was filmed. An air mail stamp cost six cents. Congress passed anti-immigration laws and empowered consulates to deny visas to anyone, thereby causing multitudes of Jewish, Chinese, and Latin American refugees to stream across the desert border with Mexico into California. Have things really changed? The images of 1941, terror outside the United States, self-sufficiency at a bucolic farming society at home with a can-do military keeping watch, seem to be the images we have of ourselves today. 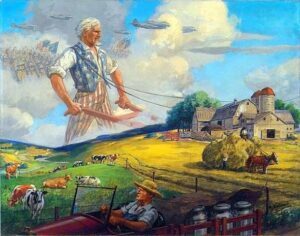 In truth, our farms are dominated by corporations, our factories are pretty idle, and our military is anything but spartan or conscripted. And you will read this via a computer, not after opening something that came through a post office. Things have changed in those ways and countless others. And, looking back at my parents’ 1941, I have to wonder how much we really want to go back to the days of isolation, short life spans, staying home for life, and farm labor for everyone. So, maybe my question should not be whether anything has changed. Instead, maybe we should ask whether anything has been learned.